CoinTrapTM Commentary: As the 39th state to enter the Union, North Dakota achieved statehood on November 2nd, 1889. North Dakota is located in the midwestern-northern part of the United States bordering Canada. A large portion of North Dakota land was included in the Louisiana Purchase of 1803. North Dakota is known for its fine arts museums, agriculture, energy industry, and higher education institutions. 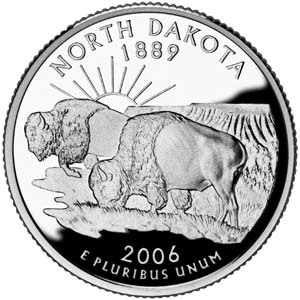 The North Dakota State Quarter highlights a pair of grazing American bison in the foreground. In the background, a sunset view of the rugged buttes and canyons that symbolize the State’s Badlands region hovers above the bison. Coin Value: What is the value of your North Dakota Quarter? As usual, that depends. The North Dakota Quarter worth or value depends on these main factors: (1) your coin’s grade, (2) whether it is a proof coin (Deep Cameo or DCAM) having a mirror-like polished finish, (3) scarcity/demand, and (4) whether it is the silver version. Regarding your coin’s grade, it has become a standard in the field of numismatics (coin collecting) to grade coins on a point-scale from 1 (poor) to 70 (perfect). This is also referred to as the “Mint State” or just “MS” for short. Click here to find the up-to-date estimated value of your 2006 North Dakota State Quarter coin from the Professional Coin Grading Service (PCGS®), which takes all four factors mentioned above into account*. If you do not know the grade of your North Dakota Quarter, you can take it to your local coin dealer and ask that they have it graded at one of the three major coin grading services.